Danielle Shockey has fond childhood memories of being a Girl Scout. “I remember my mom as my troop leader. I remember selling cookies and friendship,” she said. 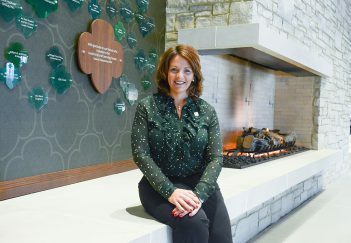 But Shockey, a Carmel resident who has been CEO of Girl Scouts of Central Indiana for one year, is convinced that modern Girl Scouts have even greater opportunities. GSCI is one of more than 100 Girl Scout Councils the national organization has established to oversee troops throughout the nation. Each council is in charge of a geographic area. 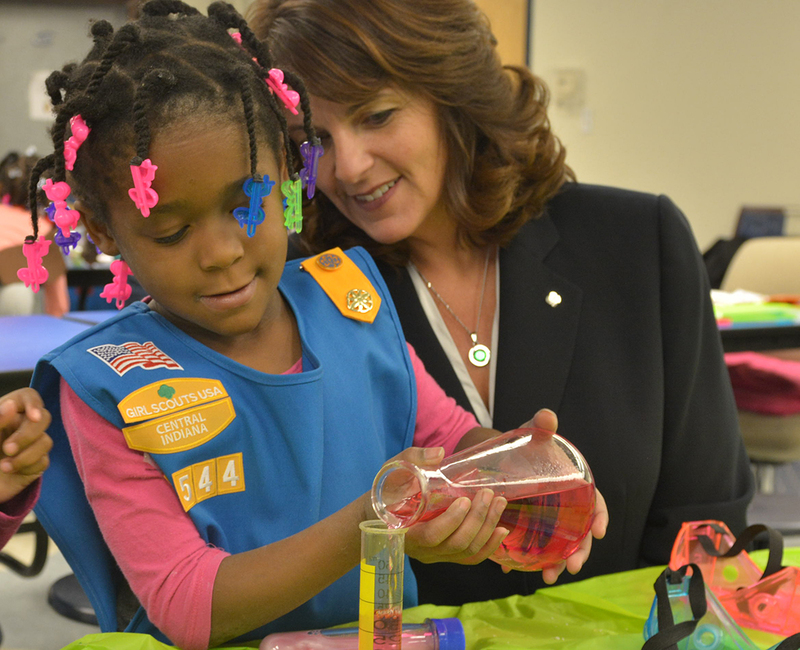 Girl Scouts of Central Indiana covers 45 counties, with a membership of more than 29,000 Scouts. For Shockey, the task of managing so many troops was made easier by her previous experience in education. A native of Altoona, Penn., Shockey moved to Indiana in 1983 and to Carmel in 2015. Her four children, ages 11 to 18, helped solidify her passion for education. She haa bachelor’s degree in elementary education from Ball State University. Her master’s degree in educational leadership, which she earned while teaching in Fort Wayne and Lawrence Township schools, is from Indiana University. Shockey served as a school principal in Lawrence Township before becoming deputy superintendent of public instruction at the Indiana Dept. of Education in 2013. In late 2017, she became CEO of the Girl Scouts of Central Indiana, a role which she says is largely about educating the public. Some of Shockey’s goals include increasing membership and ensuring that GSCI is included in conversations about young women’s futures. Shockey takes a hands-on approach to leadership, according to Girl Scout Troop Leader Gayle Lucka of Carmel-based Troop 1231. For Shockey, Girl Scouts is about offering social and educational opportunities to girls of all ages. Girl Scout Cookie sales help fund various activities and learning opportunities for troops. Cookie funds also help troops launch projects that benefit their communities, such as park and playground restorations or urban gardens. The 2019 cookie season kicked off on Jan. 12. A new cookie, Caramel Chocolate Chip, is on sale for the first time this year. These chewy, gluten-free cookies feature caramel, chocolate chips and sea salt. However, a classic cookie is expected to continue to be the top seller: Thin Mints. These popular chocolate and mint cookies account for nearly 25 percent of annual Girl Scout Cookie Sales. In Hamilton County, Girl Scout troops will set up booths to sell cookies at many public locations, including local grocery stores. To find details about where and when to buy cookies, use the “Find Cookies” tool at girlscouts.org/en/cookies/all-about-cookies/How-to-Buy.html or download the Girl Scout Cookie Finder app. With sales of about 200 million boxes, or nearly $800 million per cookie season, The Girl Scout Cookie Program is the largest girl-led business in the world. Selling cookies helps troops develop business skills, including goal-setting, money management and people skills.